Step-by-step instructions on sending SIS and JAR files via Bluetooth on S60 devices (Symbian OS 9.x, Series 60 3rd edition). With this you can now send installer files directly from your phone to your friends! Petunjuk mengirim file SIS dan JAR lewat gigi biru (Bluetooth) di ponsel Nokia S60. Dengan ini anda bisa kirim file instaler langsung dari hape ke teman-teman! Sending SIS or JAR files in Symbian Series 60 (S60) 3rd edition Nokia mobile phones. The list of the phones can be seen on the list below. Mengirim file SIS atau JAR bagi pemilik HP Nokia Symbian Seri 60 edisi 3. HP yang termasuk kategori itu di antaranya dapat dilihat di daftar di bawah ini. When we have a neat or interesting program in our mobile phone, our friends ask us to share or send the program. Even if we have the installer (SIS or JAR) files, everytime we try to send the program via Bluetooth there is an pop-up error message, "Unable to send protected object". Fortunately there is an amazing person who can overcome this problem. Both SIS and JAR files can be sent by Bluetooth without renaming the files. Sering kali kita punya program bagus dan menarik di hp lalu teman minta bagi2 programnya. Walaupun instaler (sis maupun jar)nya udah disimpen di hp, pas mau kirim file pake gigi biru (bluetooth) selalu keluar pesan "Unable to send protected object". Untunglah ada orang hebat yang bisa mengatasi masalah ini. Baik SIS maupun JAR bisa dikirim. Petunjuk berikut pakai bahasa Inggris. Download the freeware file manager program Y-Browser at least version 0.88. The homepage is here, but the installer file is also available here. 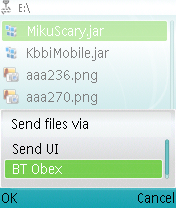 To send Symbian installer files (SIS) and Java archive files (JAR) via Bluetooth, you will also need a plugin called BTObex Sender. The plugin can be downloaded here. Install the above two files on your phone. There are many ways to install, the easiest one is using PC Suite if your phone is already connected, or by sending the files using Bluetooth on your computer. Depending on the phone, infra-red may also be possible, as well as transferring directly from internet at your phone (Type the address www.kejut.com/download/328 and www.kejut.com/download/329 in your phone). After installing both of the files, open the Applications menu on your phone, go to a new folder called Dr.Jukka. 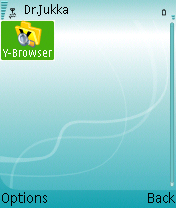 There you will find Y-Browser icon. Run it. Select the file you want to send. 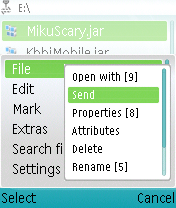 Then, click the Options soft-key, select File and then Send. You will see this menu. Select BT Obex. Then you can select the recipient and they will receive any file you want to send! The below list is only to help people searching using different terms. Wah, Yuku hebat. Kok gak nulis gini dari dulu saja. Itu belum selesai menerjemahkan semuanya ya? Kok instruksinya dlm Inggris saja. Saya heran, sudah 11 hari kok blm ada yg nulis komen ya. Jadi yg pertama deh! Bang Yuku gua minta dmn alamat buat ngedownload y-browser?kq gua nyari gk ktmu2.uwdah abiz pulsa bnyk nich!!! Akhrny Sudah dpt y-browser dr stus km Bang Yuku, mkcih ya!!!??? akhirnya... dulu kudu pake sony erricson temen saya buat ngirim2 file jar n sis..
buat pengguna symbian platform 40 & selaen merek nokia ada cara lebih gampang,..
mending rename aja format/extentionnya aja,. yang gw tau os nya itu ngebaca pihak ke3 (sis/jar) sebagai file yang punya licensi,..
kalau loe rubah formatnya secara gak langsung loe udah ngilangin metode pembacaan licensinya,..
Pake fileman atau fexplore jg bs!